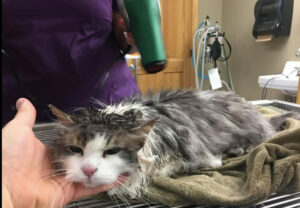 A team of veterinarians revived a three-year-old cat named Fluffy who was found nearly frozen to death in a snowbank in Kalispell, Montana. 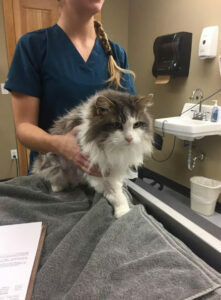 Temperatures had fallen to about 10 degrees, when Fluffy’s owners found her unresponsive and rushed her to the Animal Clinic of Kalispell. Although the normal body temperature of a cat is around 101 degrees, Dr. Clark says that Fluffy’s temperature was so low — “less than 90 degrees” — it didn’t even register on a thermometer when she was first brought in to the clinic. Initially, Dr. Clark thought her prognosis was “guarded, at best.” But he credits his staff with Fluffy’s amazing recovery. Download a client handout on how to keep small animals safe during extremely cold weather.